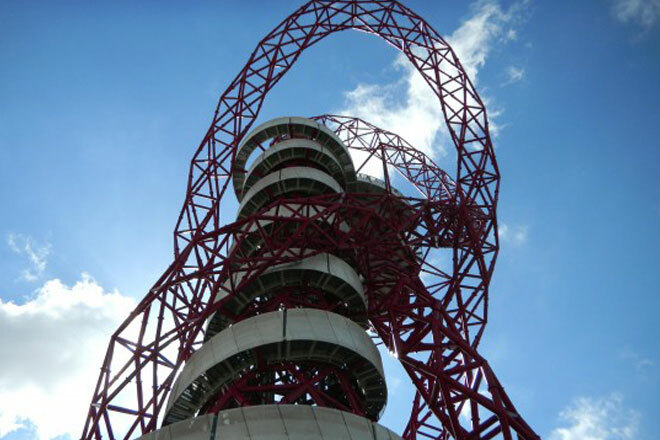 THE ARCELORMITTAL ORBIT OFFICIALLY UNVEILED! After 18 months of construction The ArcelorMittal Orbit has officially been unveiled! A launch ceremony took place last Friday for which visitors and press were invited to travel up the tower to the circular viewing platform, with vistas over the Olympic stadium and the London skyline. The 114 metre high structure is built from 2,000 tonnes of steel – of which 60% is recycled. Of the design, Cecil Balmond says “unlike the vertical tower with only one stability there are several in the Orbit. If a line comes out of the ground and leaps into space to orbit around a vertical but each time the path overlaps it touches only points in space to form a scatter of structure; and in between various freedoms are allowed”.